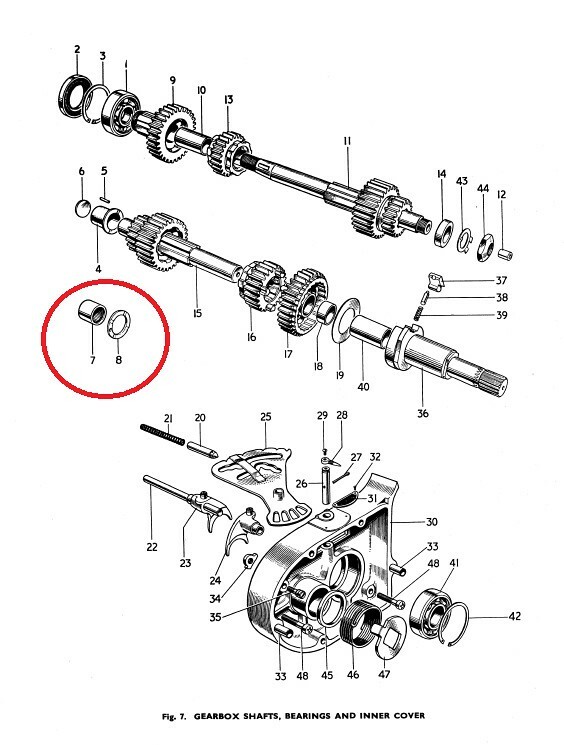 When I stripped the transmission on my 1966 T100SR, there was no thrust washer (Item #8 on the attached drawing, 57-1607 or T1607) between the layshaft needle bearing and the back of the last gear as shown in the parts manual. I don't know the history of this machine at all other than it's sat since 1972. I don't know if I am missing the washer or if it was only installed from the factory when needed. It seems to me that the layshaft bearing (item #7 on the attached drawing) can be installed to take up any play that might be present. Have any of you cracked yours open to find the same thing? If I am reading the parts manual correctly, it appears that the 3TA and 5TA models had fitted the bronze layshaft bush, part number T1367 and #4 in the diagram, whereas the T90's and T100's had the needle bearing fitted ? Regardless, either a previous owner was in the gearbox and forgot to reinstall the thrust washer or an assembly line worker missed it in the initial assembly. That's my theory. Is the layshaft bearing a bush or a needle roller bearing? If the latter then you need the thrust washer. But if the former then the flange on the bush performs the duty of the thrust washer. He states that he has the needle bearing. As to why the thrust washer is missing could be one of a few possibilities. All speculation at this point. Sorry, Jon, missed that point. Certainly if needle roller then it needs the thrust washer. Maybe came out with the gear set while dismantling and fell on the floor? If you look closely through the gearbox case at the needle roller bearing, you should find that it sits somewhat proud of the surface. This projection locates the ID of the bronze thrust washer. You may also be able to see a slightly smoother ring on the alloy case surrounding the bearing, corresponding to where the washer would have been once upon a time. Within that ring there should be a peg or dowel, which would have located in a hole in the washer, to prevent it rotating and wearing the case. It is identical to the arrangement at the other end of the layshaft, at the inner face of the inner cover. These pegs can very easily cause problems with incautious assembly. If the washer loses its location on the peg, when the inner cover is tightened the layshaft will lock up, and if further tightened, the peg can be pressed into the case, causing an awkward situation to resolve. Been there sadly. I'd suggest carefully checking that this hasn't been the case, and a PO hasn't just left the washer out to be able to assemble the box. I've not tried a box missing a washer, but the extra maybe 80 thou slack in the layshaft gears can't be good? Thanks for the replies. I got the bike as a roller with most of the engine, minus the head, still assembled in one box and almost everything else in a second box. I'm certain the cases have been opened once before. The spring that would be found behind the intake cam was in the bottom of the box of parts and a small piece of roofing shingle was found in the sump. I got a hold of a used washer over the weekend. It fits right where it should. The 500 only uses one washer. The 650 and maybe 750 use one on each end of the layshaft. If I can get a suitable driver, I'll be installing the needle bearing this afternoon and hopefully will start assembling the cases after that. So does it use the washer on the drive end, along with the needle bearing? and the other end is a bush? When installing the needle bearing on the drive side some years ago in my 67 T100R, I used a drift from a set that I had had a friend make for me. After I had heated up the case I merrily and quickly drove the bearing home and realized soon after that I hadn't looked to see if there was provision in the drift to avoid driving the locating pin into the case and did so. Trouble was, I had to get the rest of the pin ground off and a new one installed.....So if you're making a drift for the job be sure to cut part of the drift away to accommodate the locating pin. Luckily another friend who is a motorcycle builder and racer worked at the machine shop and was very good at doing this kind of work. Just a thought.